How to drink tea everyday? 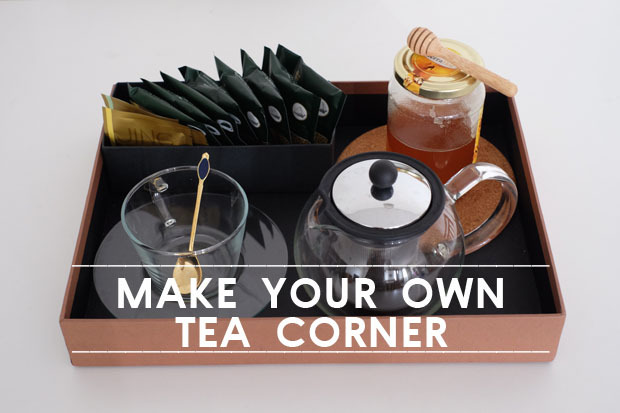 Create a tea corner! Sipping tea while winding down after a long day at work is probably one of the things many of us wish we have time for. Those who are into holistic health and natural beauty may dream of having a cup of high antioxidant green tea every morning. I love tea. Before, drinking tea is something that I only do on holidays and on certain weekends. Boxes of high-quality tea bags that I’ve bought with intention of establishing a tea-time culture were left untouched in the cupboard. However, recently I manage to have a cup of tea almost every morning. Does the idea of having tea daily makes you happy? 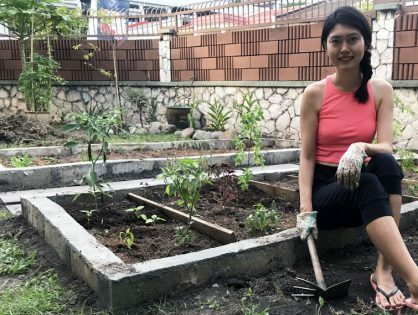 If you follow JewelPie’s on Instagram, you would see a lot of mention on Marie Kondo’s idea and a video on a smart way of folding clothes the KonMari way. 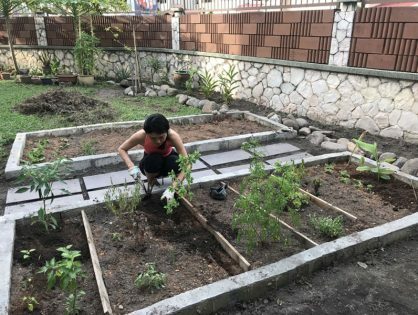 The Japanese tidying consultant said that you should only keep things that makes you happy and that tidying is a tool to establish the lifestyle that you want. 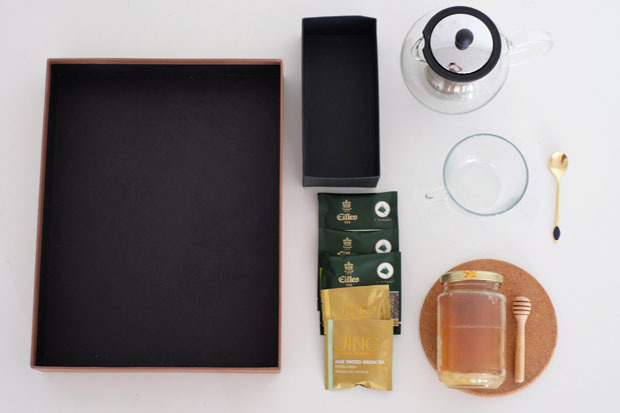 Get a box which act as a box/tray to hold all your tea-making necessities. I’ve got a gift box which measures 10 inches wide and 13 inches long. 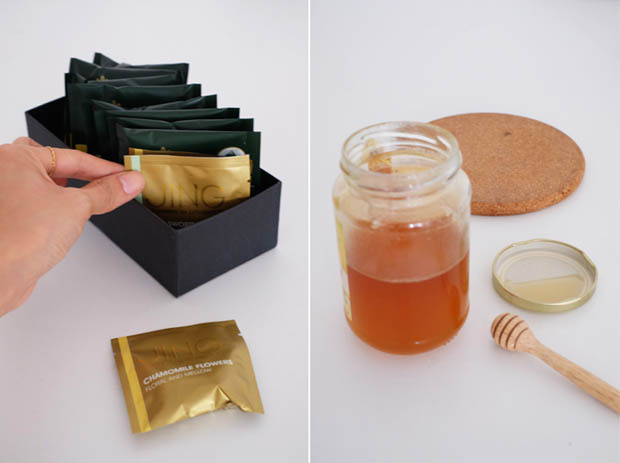 It’s perfect to put a small tea-pot, tea-cup with saucer, honey and tea bags. A large shoe box might do the trick. Buy tea bags instead of tea leaves. To drink tea daily, it has to be very convenient. So choose teabags over tea leaves. Use a sunglasses box to put teabags. The size it perfect to put about 15 packets of teabags. 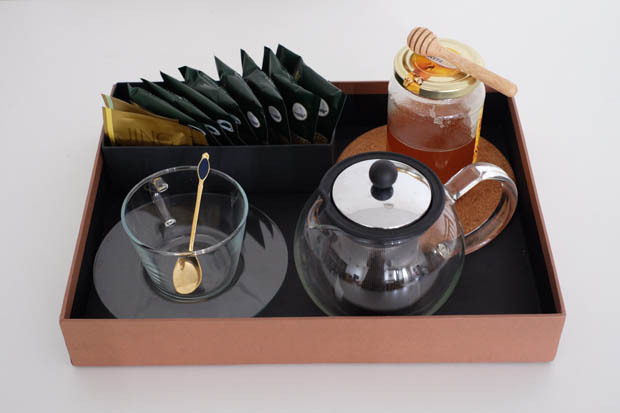 Place sunglasses box with teabags, teapot, tea-cup with saucer and stirrer onto the tray. Arrange them neatly. Put other necessities (optional) I like to drink flower tea with honey. 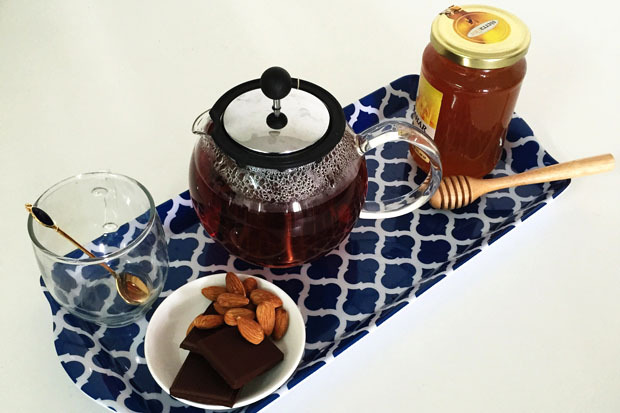 If you’re like me, you can place a jar of honey and a honey dipper on you Tea Tray too. How to have tea everyday? Every morning, I’ll heat up water in the kettle and then proceed with my morning routine (brush teeth etc). I’ll return to the kitchen, put a tea bag and hot water into the pot. I’ll put the teapot and tea-cup on a light melamine tray, bring it to the living room and enjoy a pot of tea. 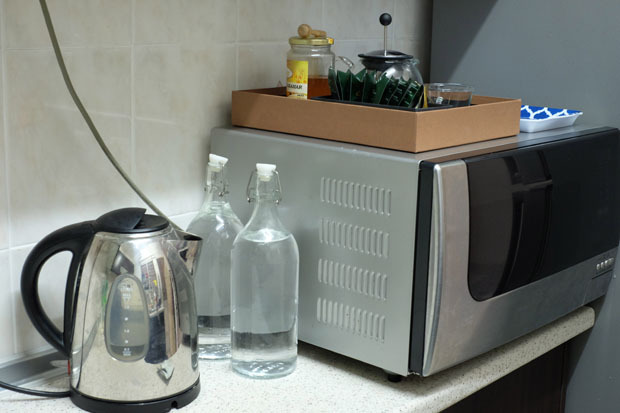 To make it super easy, place the Tea Tray near where you put your kettle. For me, that’s right on top of the microwave. Place light tray beside the Tea Tray. It allows me to carry the tea-pot and cup from the kitchen into the living room. If I don’t get to drink green tea in morning, I’ll try to unwind with a pot of chamomile tea sweetened with honey in the evening. The sleep-inducing tea is normally accompanied with a few pieces of dark chocolate and nuts. Would you like unwind at home with a pot of tea? 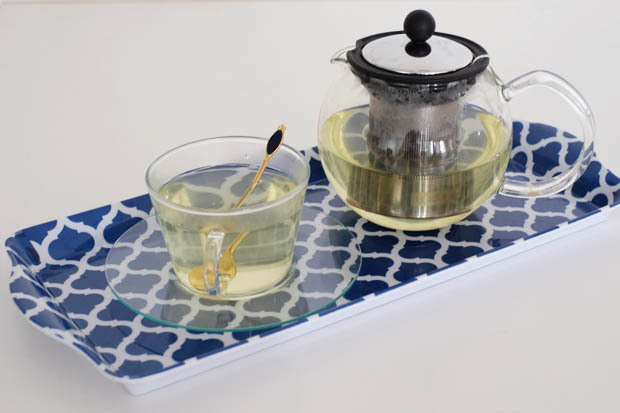 Try making your own Tea Tray!